Welcome to the heart of the White Lion’s Sacred Territory known as Tsau, originating from the ancient Bushman word incantation – “Starlion”. The group will be met at Eastgate Airport, Hoedspruit and transported to the White Lion sacred heritage lands. Please note: if you will be traveling prior to in South Africa, please be sure to meet at Eastgate Airport no later than 1pm. During and after lunch, a short but important introductory program and intention setting prepares the group for an uplifting experience in the Heart of the White Lions Sacred Territory. 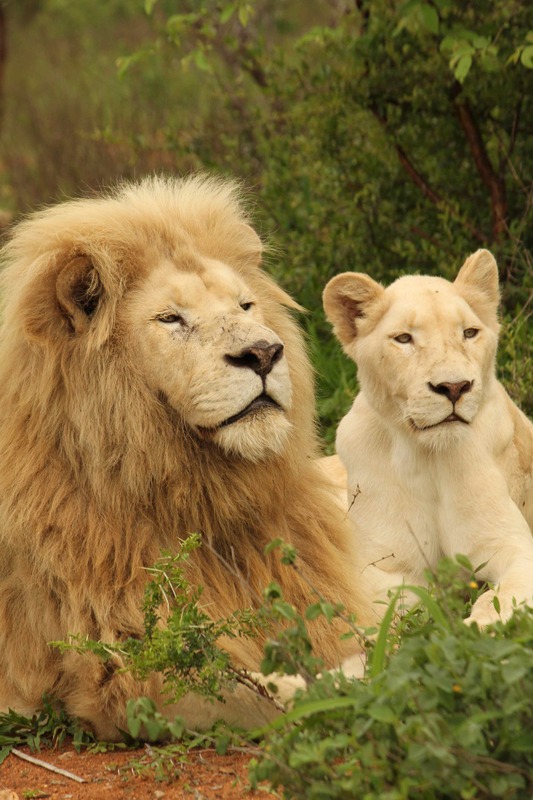 Linda and Jason will share personal anecdotes and discuss the projects undertaken by the Global White Lion Protection Trust as well as the discovery of the genetic marker that makes the White Lions unique. The group has a chance to settle in prior to heading out on an open vehicle game drive to be introduced to the Royal Prides. In the evening guests will enjoy a traditional meal around the fire and can retire early in preparation for the key events of important days ahead. A dawn departure to track the illusive White Lions in their natural kingdom starts the day. After breakfast Andrew discusses Sacred Warriorship and how it is witnessed in action through the LionHearted leadership, implemented by the WLT, in this challenging but highly successful project. Linda introduces the group to the “technology of love” in preparation for animal communication techniques with the White Lions and shamanic techniques for receiving messages from the White Lions in meditation and dream time. A delicious homemade lunch, prepared by Shangaan chef Elanani is followed by a siesta and deep relaxation integrating time, place and purpose before the group heads out to commune with the majestic White Lions. The day draws to a close with a screening of the National Geographic documentary which gives information on the project as well as Linda and Jason’s battle to save the White Lions of the Timbavati. Early morning lion tracking should leave the group in high spirits for the remainder of the day. During the morning Andrew will present his vision of the laws of Sacred Leadership taken from the major mystical traditions and his own experience as the architect of Sacred Activism. After lunch, Andrew leads the group in the essential heart practices for the Sacred Warrior, and how these apply to the 12 Laws of LionHearted leadership. The LionHeart : That condition of Fearlessness inspired by Love. How to reawaken it. Embody it. Live it. How to equip and empower yourself through the LionHeart to change your world. The group joins in a day of cultural activities with visits to local Shangaan schools, the orphan centre, a local crèche or the Elder’s Weavers, all supported by the Global White Lion Protection Trust. As honoured guests, share their rich culture and White Lion heritage with traditional displays and lively celebration. Donations to these facilities are gratefully accepted and recommended at R100 per guest per destination. This fun filled day culminates with an invitation from Chief Harmony Khosa (principal guide) and Matimba (his brother); nephews of Maria Khosa, Lion Queen of the Timbavati; to visit their ancestral home. Enjoy a delicious traditional dinner, with warrior dancing around the fire drumming up the excitement of the heart and soul of Africa in the presence of the Ancestors of these sacred lands. 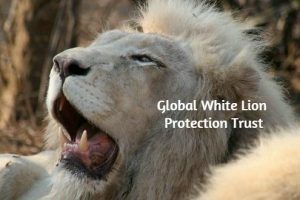 The Global White Lion Protection Trust will gladly add this charge to your donation breakdown and make payment on your behalf to the Village. 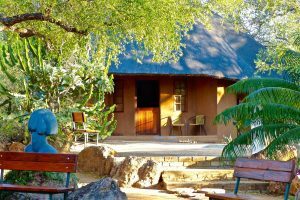 Take advantage of a rare opportunity for authentic bone divination given by the traditional healers of the Khosa village. We recommend a donation of R350 for personal and R500 for group divinations, inclusive of an interpreter, payable directly to the healer. A tranquil day of silence is broken at sunset at the Npenvu Treehouse overlooking White Lion sacred territories. 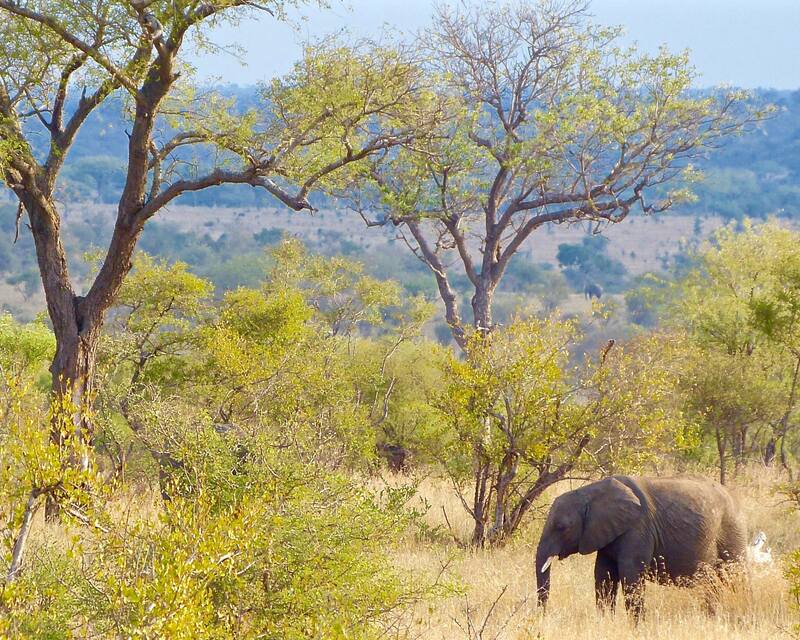 drive, in an open safari vehicle with professional guides, through elephant, giraffe, zebra and antelope populated savannah grasslands, dotted by rivers where crocodile and hippo may emerge to sun themselves. Whatever you may see is a blessing from the great creative force that is “Mother Nature”. Do not be limited by expectations of viewing the so called “Big Five”, any encounter with creatures in their natural eco-system is a profound privilege. As “King of Kings”, the Lion is a true apex predator, or capstone species, at the tip of the pyramid of life and governs all other creatures, great or small, in these wilderness lands. Packed lunch is provided at a spectacular site overlooking the Lebombo Mountains to Mozambique. Wrap up this unforgettable day back at Camp Unicorn with tranquil evening discussions incorporating everyone’s personal connections with Nature. After a healthy breakfast, following dawn communion with the White Lions, guests spend the day in reflection and gentle journeying into the Inner Worlds. A sumptuous picnic lunch will be hosted by Linda under the Giant Wild Fig. This is followed by White Lion Meditation, led by Linda, which takes the group on a journey of enlightenment and empowerment, sharing White Lion techniques to help integrate the principles and qualities of these most radiant of animals into personal lives. Tuning in to these qualities helps achieve greater self-fulfillment, self-healing, leadership potential and effective decision-making. Evening lion monitoring follows a walk to the site of the Crystal Star Lion monolith. After a brief but very powerful leadership activation of the LionHearted law of unlocking your unique gift, participants set out on a liberating excursion into the Drakensburg (Dragon) Mountains, a massive tectonic plate which links with the East African Rift Valley. n, the world’s third largest canyon, is situated on the cusp of the Kruger to Canyon’s biosphere, which has been declared by the United Nations as one of the world’s prime biosphere regions. Your journey will include amazing sites such as God’s Window and the Ancient Stone Altar. 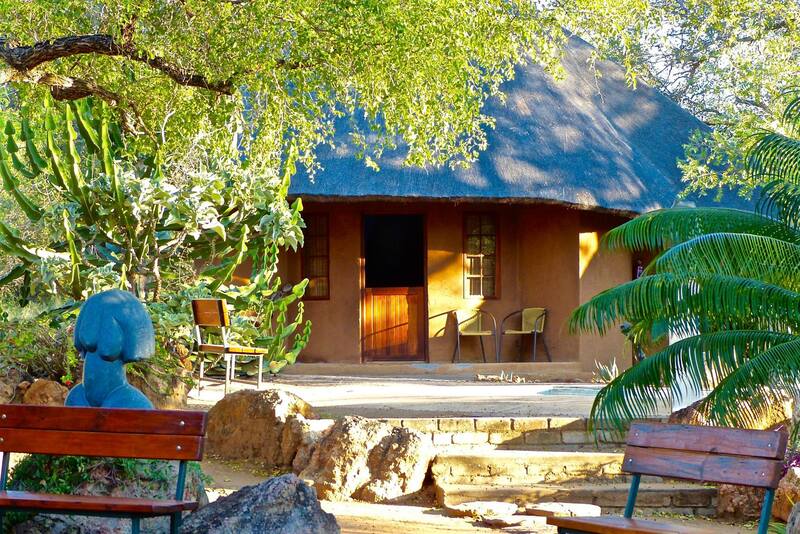 Enjoy lunch at Graskop and explore the vibrant indigenous craft markets. A day to select gifts for loved ones; express your God given gifts; and celebrate Mother Nature’s gifts and blessings. Dawn brings the final chance to visit the sacred White Lions in their endemic habitat. After breakfast the journey concludes with intention setting and vision holding in the serene beauty of this environment, connecting the group to their LionHearted natures and a higher purpose. Before last goodbyes are said, the group rounds up for a ceremony of thanksgiving with final prayers for the White Lions and the birth of a new world. You are able to depart on your onward journey knowing that you have established a strong connection with Tsau and that you carry the Spirit of the Sacred White Lions of Timbavati with you always. Note space is limited to 12 participants. Airfare is not included. Double Occupancy only. Due to the sensitive nature of the scientific re-introduction of a critically endangered animal, this project is not open to the general public, but the WLT is pleased to showcase its aims and objectives to special interest groups, likely to become long-term supporters and donors of this exceptional ground-breaking project. This itinerary is not set in stone, and may change depending on the weather, the people and most important of all, the animals. Please observe that there are strict safety and security protocols in respect of the reintroduction of the White Lions. Our scientific monitoring vehicles do not intrude on the White Lions’ space, and we ensure that we keep our voices as low as possible when approaching them in the wild. The contact with the White Lions is a non-photographic experience and we avoid taking cameras, zooms or spotlights and other hi-tech devices into their environment and instead enter into the magic of their natural existence and share its timeless beauty. Magnificent photographic studies of the White Lions and other mementos are available. 100% of proceeds go directly to the protection of the White Lions in their natural habitat. 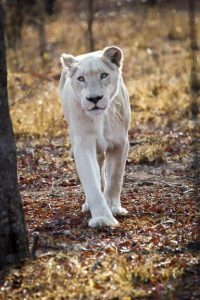 White Lions are exceptionally rare. They have been almost completely eradicated from the wild: artificially removed from their natural system and sold into zoos and circuses around the world since their ﬁrst appearance in the wild in the 1930s. The result of a rare “Genetic Marker” discovered through the collaborative scientific research led by the WLT, White Lions have been brutally sped-bred and held in captivity to be killed by the notorious ‘canned hunting industry’. Against great odds, the WLT has initiated a world-first re-introduction program, and has successfully re-introduced three prides of high genetic integrity back into the wild that are surviving self-sufficiently. Currently, there are less than 10 White Lions in their endemic habitat, most of which are in the protected area of some 4400 acres created by the WLT in the heart of their ancestral heritage lands. The WLT is a non-proﬁt scientiﬁc and community conservation organization dedicated to saving this magnificent animal, with 85-90% of all donations allocated to ensuring the survival of the White Lions, and supporting the up-liftment of an indigenous community. I understood or rather EXPERIENCED how nature is in constant communication with us, the white lions showed me what I needed to see, no doubt about that. Andrew Harvey’s company was a treasure, he is so intelligent with an amazing sense of humor, helped me find deeper truths about myself effortlessly and lightly, all with genuine care and warmth. Linda Tucker’s presence and humanness was a gift and an inspiration. I am so glad I attended that amazing workshop and met the amazing people who were part of it , and would strongly urge whomever feels called to do it to just go ahead and jump in. Camp Unicorn proved to be a monastery in and for nature. Like novices in the Middle Ages, one goes through the gates and portals that define an enclosure in the ‘desert’ from which, unencumbered, one turns heart and mind towards the rare white lions, the Kings of Kings – solar animals whose forceful presence, elegance and power invite to reconfigure one’s own place in the hierarchy of life manifestations. Humble intelligence, serene empathy then become the tools for formatting man’s understanding of the macrocosmic forces reflected in the microcosm one embodies. 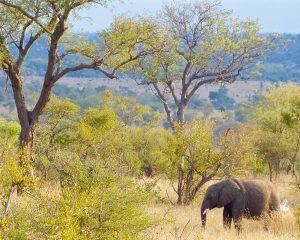 The quest of these ‘monastic ascetic’ few days was supported with grace and loving kindness both by Linda Tucker and Andrew Harvey so that my stay in Timbavati turned into a rewarding experience in personal and universal truths as offered by Nature. Amazing trip to the white lions and their homelands! These magnificent beings are clearly avatars – an opportunity for an encounter with the divine! Take advantage of the opportunity! Having read Linda Tucker’s 2 books on the White Lions and having taken Andrew Harvey’s course, Path to Christ Consciousness for the past 9 months, I was delighted to sign up for this amazing retreat. Africa has always felt like home to me even though I live in Canada. This particular retreat was one of the most profound spiritual journeys of my life so far. 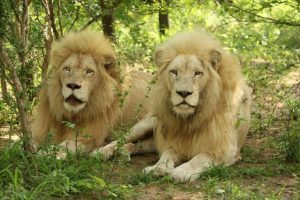 The power of the White Lions and the messages they shared, being on the sacred land itself, the exquisitely competent and inspirational facilitation of Linda and Andrew as we dove deep into our own being, all contributed to this amazing experience. Spending time at Camp Unicorn, sleeping in round huts with straw roofs, eating the most delicious local food and visiting people of the villages as well as an amazing day at Kruger Game Park, seeing more local animals than I could have imagined added to the awe and wonder of our time together. When I returned home, those who knew me, recognized the depth of my encounters in Timbavati by the “glow in me and around me”. I will carry the treasures that were unearthed for me on this retreat in my heart and soul forever. I am deeply grateful to ALL for this opportunity.